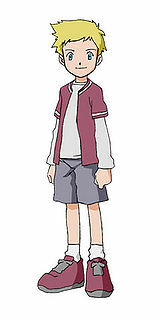 Wallace is a protagonist of Digimon Adventure 02 who appears in the movie Digimon Adventure 02: Digimon Hurricane Touchdown!! Supreme Evolution!! The Golden Digimentals and some other media. Wallace is an American Chosen Child from New York City. He is slightly arrogant and tends to bottle up his feelings, but is clearly a kindhearted person who cares for his friends and Digimon. He is a bit of a flirt and learned Japanese from a Japanese girlfriend. When Wallace was young, he found a DigiTama which hatched into twin Digimon that would eventually evolve into Terriermon and Lopmon. While playing out in a field together, a strange wind picked up and one of the twins, Chocomon, disappeared. Seven years later, Chocomon evolved into Wendimon and was driven insane. Trying to find the young Wallace he remembered, he kidnapped six of the original Japanese Chosen Children and placed them in another realm, where they were slowly reverting into small children. Wallace and Terriermon, chased after Wendimon, but he disappeared. It was then that Wallace decided to travel to his family's summer home in Colorado, named Summer Memory. He was unaware of the fact that two of the Japanese Chosen Children, Takaishi Takeru and Yagami Hikari, had witnessed his attempt to reason with Wendimon and decided to follow him to Summer Memory. He was already at Denver, hitching a ride on the back of a semitrailer, when he met Motomiya Daisuke, Inoue Miyako, Hida Iori and their Digimon; they were the three remaining Japanese Chosen Children, called to the United States by Takeru and Hikari. After they got off the truck, Wallace called his mother Daisuke frustrations inadvertently caused a truck driver to pull over and pick them up. However, only Miyako and Iori managed to get on the truck before it drove off, leaving Wallace and Daisuke behind. As they attempted to make their way to Summer Memory on their own, Wendimon attacked them, forcing V-mon to evolve into Fladramon and Terriermon to evolve into Galgomon to fend him off. Wallace tried to reason with Wendimon again, but the crazed Digimon disappeared once more. He and Daisuke then rode on Lighdramon's back all the way to Summer Memory. At Summer Memory, they reunited with Miyako and Iori and discovered that Takeru and Hikari weren't there yet. They decided to camp at the flower field Wallace lost Chocomon at and wait for Wendimon there. That night, Daisuke confronted Wallace, demanding that he explained the situation. Wallace was forced to admit that Wendimon was indeed his Digimon, and Daisuke empathized with Wallace's difficulty to attack his beloved partner. Wallace comforted Daisuke, saying they might still find a way to turn Chocomon back to normal. The next morning, Wendimon appeared in the field, and finally revealed his desire to be with the Wallace he remembered again. When Wallace told him it was impossible, Wendimon went into a rage and evolved into Andiramon. Following that, a short fight with the children's Digimon ensued, and Andiramon evolved into Cherubimon, causing the Digimon to revert to their Child forms with his attack. Just then, Takeru and Hikari arrived with Angemon and Angewomon. Cherubimon turned everything into a dark void and turned all the Chosen Children into young children, but Angemon and Angewomon managed to evolve to their Ultimate forms of Seraphimon and Holydramon for a short time. Though quickly defeated, they unlocked Daisuke's Digimental of Miracles and Wallace's Digimental of Fate, which allowed V-mon to evolve into Magnamon and Terriermon to evolve into Rapidmon. Though Cherubimon proceeded to eat them, the two destroyed him from the inside out, returning everyone to their rightful age and place and purifying Wallace's Digimon. Though Wallace was sad to see his Digimon die, he was glad that Chocomon was happy again. Following this, Wallace and Terriermon parted with the Japanese Chosen Children, not before Wallace kissed Miyako and Hikari on the cheek. As he was speaking to his mother on the phone and promising to come home soon, he and Terriermon saw a DigiTama washing up on the shore - Chocomon had apparently returned to his parter. In the summer of 2003, Tachikawa Mimi invited Daisuke to New York City for summer vacation, where he reunited with her and Wallace, who she also invited. Wallace was quickly annoyed with Daisuke, who was depressed over his unsuccessful love life and a lost soccer match. When, without warning, the entire city fell under a strange winter and became deserted, Wallace suspected that it had to do with Daisuke's foul mood. Upon meeting Nat-chan, he was surprised that she preferred Daisuke over him. Soon, she started getting jealous of Gumimon and Chibimon for their close partnership with Wallace and Daisuke, and showed her true face as a huge, clawed Digimon who is lonely and starved for affection. When Daisuke tried to speak to her heart, Wallace was worried for his friend's life and begged him to run, but Daisuke managed to heal Nat-chan. Soon, they returned to the real New York, and upon finding Nat-chan's egg, the group decided to go and find her true partner. ↑ The Character card released with the CD lists him as being the same age as Daisuke. This page was last modified on 10 April 2019, at 09:03.